Land Creatures Might Not Have Come From The Sea Conventional wisdom holds that complex life evolved in the sea, then crawled up onto land. But a provocative new study argues that the procession might be drawn in the wrong direction. The earliest large life forms may have appeared on land long before the oceans filled with creatures. This story is told from fossils that date from before an extraordinary period in Earth history, called the Cambrian explosion, about 530 million years ago. That's when complex life suddenly burst forth and filled the seas with a panoply of life forms. Paleontologists have found fossil evidence for a scattering of fossil animals that predate that historic moment. These mysterious organisms are called Ediacarans. Many scientists have assumed Ediacarans were predecessors of jellyfish, worms and other invertebrates. But Greg Retallack at the University of Oregon says he always had his doubts. Retallack has been building the case that Ediacarans weren't in fact animals, but actually more like fungi or lichens. And if that idea weren't enough of a departure from standard theory, he now argues in a paper in the journal Nature that Ediacarans weren't even living in the sea, as everyone has assumed. He says he has reanalyzed some Australian rock where they're found and concluded that it's ancient soil, not marine mud. These early life forms were landlubbers. "What I'm saying for the Ediacaran is that the big [life] forms were on land and life was actually quite a bit simpler in the ocean," Retallack says. So does that suggest life evolved on land and moved into the ocean? "Yes, in a nutshell," he says. This is an audacious idea. But Retallack is not alone in entertaining this possibility. Paul Knauth at Arizona State University has been pondering this same possibility. "I don't have any problem with early evolution being primarily on land," says Knauth, a professor in the School of Earth and Space Exploration at Arizona State University. "I think you can make a pretty good argument for that, and that it came into the sea later. It's kind of a radical idea, but the fact is we don't know." Knauth says it could help explain why the Cambrian explosion appears to be so rapid. It's possible these many life forms gradually evolved on the land and then made a quick dash to the sea. And, he adds, "that means that the Earth was not a barren land surface until about 500 million years ago, as a lot of people have speculated." 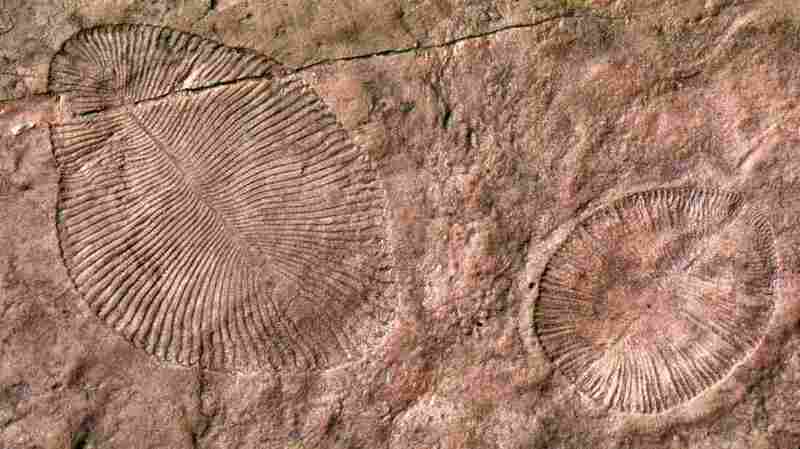 The new analysis of the Ediacaran fossils is at least a hint that this could be right. But of course if you're a scientist making an extraordinary claim, you need to back it up with extraordinary evidence. "To me the evidence is not a slam-dunk," says Shuhai Xiao, at Virginia Tech. He argues, among other things, that the same Ediacaran species found in what is arguably soil is also found in deposits that he says were ocean sediments. That would imply that the same species would be able to live both on dry land and under a salty ocean. Xiao finds that unlikely. "It's pretty hard for the same species to be able to live in both environments." So he is not convinced that Retallack is really looking at fossils in terrestrial soil. And so begins a sharp academic debate. Xiao is far from alone in his skepticism. The current ideas have many defenders. Retallack seems to relish the controversy. He knows what he's in for. "The idea that Ediacaran fossils were marine invertebrates is so deeply entrenched, it's in all the textbooks," he says. When someone (namely him) comes along and says that's not so, "it's going to be treated like a death in the family. It's going to go through all the phases of grief, starting with denial." It remains to be seen whether the story ends with acceptance of Retallack's provocative proposal.